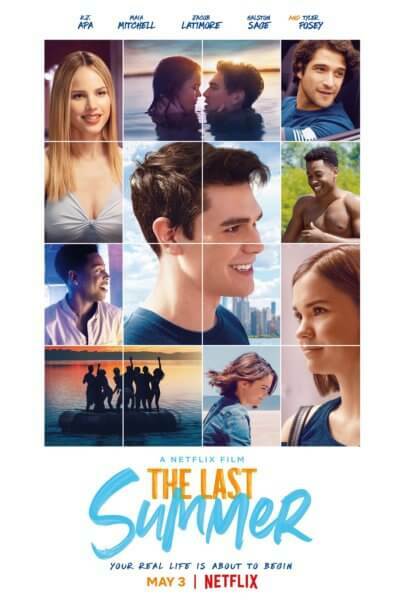 Riverdale‘s KJ Apa and The Fosters‘ Maia Mitchell lead the cast of the 2019 romantic comedy, The Last Summer, which has just unveiled its first official trailer. The rom-com which focuses on friends preparing to transition from high school to adulthood will kick off the summer season early by premiering on May 3, 2019 on Netflix. In addition to K.J. Apa and Maia Mitchell, the cast includes Tyler Posey (Teen Wolf), Jacob Latimore (The CHI, Collateral Beauty), Halston Sage (Paper Towns, Before I Fall), Sosie Bacon (13 Reasons Why), Gage Golightly (Red Oaks, Ten Days in the Valley), Wolfgang Novogratz (Grown-ish), Jacob McCarthy (A.P. Bio), Mario Revolori (Sierra Burgess is a Loser), and Gabrielle Anwar (Burn Notice). Bill Bindley (The Nut Job) wrote, directed, and produced The Last Summer, and Scott Bindley co-wrote the film. Mike Karz (Blended, Valentine’s Day) and Wayne Rice (Valentine’s Day, New Year’s Eve) served as producers. The behind the scenes team includes production designer Freddy Waff, costume designer Carla Shivener, and editor William Hoy.